Makahia is a common name shared by Mimosa pudica (bashful mimosa) and Biophytum sensitivum (Damong bingkalat, little tree plant). CHINESE: Pa chou cao, Zhi xiu cao, Hu he cao, Han xiu cao. FRENCH: Mimeuse commune, Mimeuse pudique, Sensitive. HINDI: Chuimui, Lajaalu, Lajjavanthi, Lajouni. SANSKRIT: Khadiraka, Lajjalu, Namaskaar, Namaskaari, Raktapaadi, Samangaa, Shamipatra. 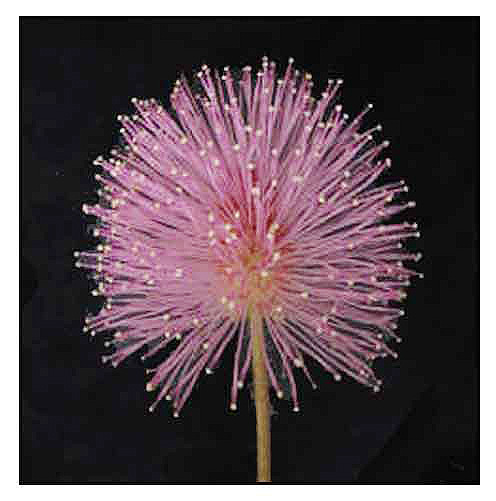 Mimosa pudica derives from the Latin "pudica" meaning shy, bashful, or shrinking, with various other equally descriptive common names such as bashful mimosa, sensitive plant, sleepy plant, shy plant, touch-me-not, and humble plant. Makahiya is a diffusely spreading, half-woody herb, with branched stems up to 1 meter long, sparingly prickly with numerous deflexed, bristly hairs. The leaves are very sensitive, both pinnae and leaflets, folding when touched. Pinnae are usually 4, digitately arranged at the end of each petiole, and 4 to 9 centimeters long. The leaflets are narrowly oblong, inequilateral, 1 to 1.5 centimeters long, sessile, sparingly bristly, with pointed tips. Heads are long-peduncled, solitary or 2 to 3 in each axil, about 1 centimeter in diameter. 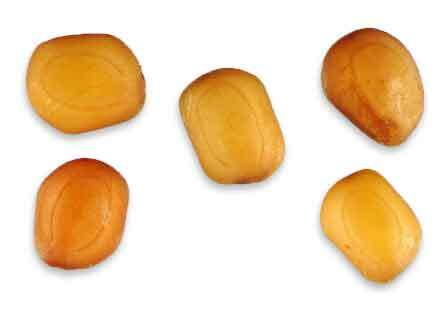 Pods are flat, slightly recurved, 1 to 2 centimeters long, with 3 to 5 one-sided joints that fall away on maturity. Florets are red in the upper part with pink to lavender filaments. - Common weed widely distributed in the Philippines in open, moist, waste places, open grasslands and open thickets, at low and medium altitudes in settled areas. - Introduced from tropical America. - Seed contains a toxic alkaloid, mimosine, a non-protein alpha-amino acid, known to cause hair loss and depressed growth in mammals (an unlikely event in humans as this will require unusually large doses). - Roots yield flavonoids, phytosterol, alkaloids, amino acids, tannins, glycoside, fatty acids. - Leaf extract have yielded an adrenaline-like substance. - Seeds contain a mucilage composed of d-xylose and d-glucoronic acid, yielding 17% greenish yellow fatty oil. - Plant contains (1) tubulin with an ability to bind colchicene with its sulfhydryl groups. (2) crocetin dimethyl ester. - Leaves and stems reported to contain the alkaloid mimosine; leaves yield mucilage; the roots yield tannins. - Considered expectorant, anti asthmatic. analgesic, antispasmodic, alterant, sedative and antidepressant. - Roots are bitter, astringent, acrid, alexipharmic, antispasmodic, aphrodisiac, constipating, cooling, diuretic, emetic, febrifuge, resolvent, vulnerary. - Leaves are bitter, sudorific, tonic. - Emetic effect attributed to mimosine. - Studies have suggested antibacterial, antivenom, antifertility, antidepressant, anticonvulsant, and aphrodisiac, antimalarial, hepatoprotective, hypolipidemic, hypoglycemic, antinociceptive, nerve regenerative, antimenorrhagic, adaptogenic properties. • The leaflets fold together in the early evening and reopens at sunrise. It is called bashful or sensitive because the leaflets fold together on touching, warming and shaking. The phenomenon is called seismonastic movement due to a rapid change in turgor pressure and changes in membrane permeability in the pulvini cells in the leaf regions with rapid movement of calcium ions. At night, the leaves also fold and bend, termed nyctonastic movements (reaction to absence of light). • When the leaflets fold together on touching, they reopen in about 10 minutes. • Seismonastic Movement / Actin Cystoskeleton: Study showed fragmentation of actin filaments occurring during bending was involved in the regulation of movement. The effect of phosphatase inhibitors on the actin cytoskeleton affects dynamic reorganization of actin filaments and causes the seismonastic movement. - In the Philippines, roots used as diuretic; also used for dysentery and dysmenorrhea. - Entire plant in decoction used as alterant and antiasthmatic. - Root considered aphrodisiac, and used for bladder gravel and similar urinary complaints. - Decoction or infusion of leaves used in asthma; expectorant. - Used for hypertension, menorrhagia, glandular swelling, sore throat and hoarseness. - Powdered seeds applied to wounds and sores. - Bruised leaves applied to bruises. - Decoction of leaves used for diabetes. - Powdered roots and leaves taken with milk for piles and fistula. - Juice applied externally to fistulous sores. - Poultice of leaves for glandular swellings. - Leaves and roots used for piles and fistula. - Used as antifertility agent in some parts of India. - 1:1 ethanol water extract used for pain relief. - In China, used for treatment of anxiety and depression. - In Ayurveda, used as antiasthmatic, aphrodisiac, analgesic and antidepressant; also used in diseases associated with corrupted bile and blood, bilious fever, piles, jaundice, leprosy, ulcers, and small pox. - In India, used for birth control. - In the Antiles, Guiana, and La Reunion, roots used vomitive. - In Indo-China, seeds used as emetic. - In Mexico, used to alleviate depression. - In Punjab and Cashmere, seeds used for sore throat. - In Concan, paste of leaves applied to hydrocoeles and glandular swellings. - Infusion of leaves used for dysentery; also as bitter tonic. - Roots used for leucoderma, vaginopathy, metropathy, ulcers, dysentery, inflammations, jaundice, asthma, small pox, strangury, fevers. - Leaves used for hydrocoele, hemorrhoids, fistula, scrofula, conjunctivitis, wounds and hemorrhages. - Whole plants used for bladder calculi; externally, for edema, rheumatism, myalgia and uterine tumors. - Whole plant, crushed, used for itching and scabies. • Antimicrobial: Ethanolic extracts activity against B. subtilis, P. aeruginosa, K. pneumonia, A. flavus and T. rubrum. The antimicrobial activity was attributed to the presence of active constituents like alkaloids or tannins. • Anticonvulsant: Study showed intraperitoneal use of Mimosa pudica decoction protected mice against pentylentetrazol and strychnine-induced seizures. • Antitoxin / Venom Neutralizing: Of 17 plants screened, only M pudica showed 100% ability in neutralizing venom lethality. Study showed the potential use of M pudica as an antivenom agent of plant origin against five poisonous snake venoms found in Malaysia. • Chromoblastomycosis: Study isolated Fonsecaea from the thorns of M pudica and suggests it could be a natural source of infection for the fungus Fonsecaea pedrosoi. • Seed Mucilage / Sustained-Release Excipient: Study showed the dissolution profile from formulation containing mucilage to drug in the proportion of 1:40 was found to be similar to the commercial sustained-release formulation of diclofenac. • Anti-Depressant: Study suggests that M pudica produces antidepressant effect in rats with a profile similar to two tricyclic antidepressants. • Mimosine / Anti-Malarial: Mimosine found to be an iron chelator acting on malarial bugs by preventing the replication of cells. • Apoptotic: Mimosine also causes apoptosis and studied for treating ovarian cancer and other highly vascularized tumors. • Nerve-Regenerative: (1) Study showed Mimosa pudica extract possess nerve-regenerative potential in rats with sciatic nerve injury. (2) In rats with experimentally injured sciatic nerves, nerve regeneration was 30-40% higher in rats treated with M. pudica extract than the hydrocortisone treated group. • Homeophathic Mother Tinctures: Study showed significant differences in samples of mother tinctures. Alcohol content influenced the viscosity of tinctures. - Tinctures, powders, seeds, extracts in the cybermarket. Antihyperglycaemic effect of 'Ilogen-Excel', an ayurvedic herbal formulation in streptozotocin-induced diabetes mellitus / S. Umamaheswari, P. S. Prince / Acta Pol Pharm, Vol. 64, No. 1. (b 2007), pp. 53-61. Comparative bioacitivtry studies on two Mimosa species / Samuel Genest, Conor Kerr, Ankit Shah et al / Bol. Latinoam. Caribe Plant. Med. Aromaticas Vol 7 (1) 2008. Phytochemical Screening and Antimicrobial Activity of the Plant Extracts of Mimosa pudica L. Against Selected Microbe / N Gandhiraja, S Sriram et al / Ethnobotanical Leaflets 13:618-24, 2009. 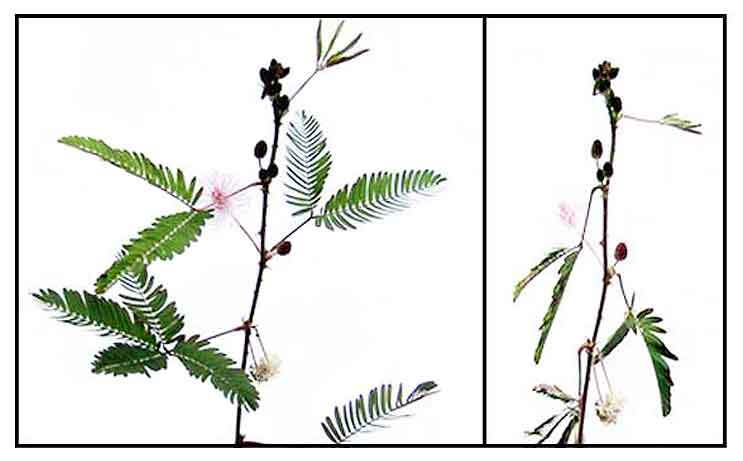 Studies of Antiasthmatic Activity of Aqueous Extract of Roots of Mimosa pudica Linn / Mali Prabha R, Patil Chandrashekhar D., Rahila Sheikh, Mali Pratibha R, Karigar Asif / International Research Journal of Pharmacy 2(1) 2011: Pp 104-110. Adaptogenic and nootropic activity of Mimosa pudica in albino wistar rats / Sibi Perumbamkudiyil Ittiyavirah, Ibrahim Pullochal / International Journal of Nutrition, Pharmacology, Neurological Diseases, 2014, Vol 4, No 4, pp 231-236. 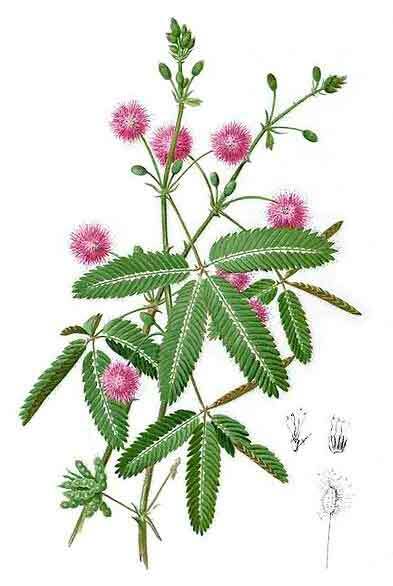 Mimosa pudica Seeds Produce β-adrenoceptor Mediated Relaxation of Buffalo Myometrium / R. Rathore, A. Rahal, R. Mandil and A. Prakash / Asian Journal of Animal and Veterinary Advances, 9: 355-361, 2014. Antimalarial activity and phytochemical screening of ethanolic leaf extract of Phyllanthus niruri and Mimosa pudica / N. Aarthi, Kadarkarai Murugan / IJPRD 01/2011; 3(3). Analgesic, antiepileptic, and behavioral study of Mimosa pudica (Linn.) on experimental rodents / Ganesh Patro, Subrat Kumar Bhattamisra, Bijay Kumar Mohanty / International Journal of Nutrition, Pharmacology, Neurological Diseases, 2015, Volume 5, Issue 4, Pp144-150.